Here in the metroplex, we are beginning to welcome in the taste of fall with a hint of lower temperatures sneaking in. The cooler weather tends to pull everyone outdoors, leaving them anxious to have friends over and watch the next big game on tv or just enjoy the weekend together. A typical host will spend a lot of time thinking through a meal or different appetizers to serve their guests but which beverages to serve are just an afterthought. That shouldn’t be the case! The right drinks can be just as much of a success as the perfect enchiladas or that perfect recipe for guacamole that you’re so famous for. You can both satisfy their appetites and also quench their thirst by planning ahead for your little get-together and renting a machine from Fiesta Freeze. We’ve collected three different recipes for drinks that will appeal to guests of all ages and will pair with an abundance of different food choices. 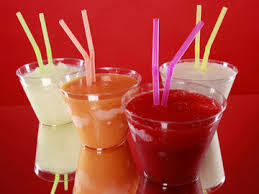 You can mix up these slushies and offer three different options to your guests, filling the machine up with one at a time. Or, you can take a look at these options and pick one that will go best with the theme you’ve got in mind! So get your plans together, get your Fiesta Freeze machine booked, and rest easy knowing that your guests will enjoy the easy flow of the slushy machine that will crank out your fabulous recipe all night long.